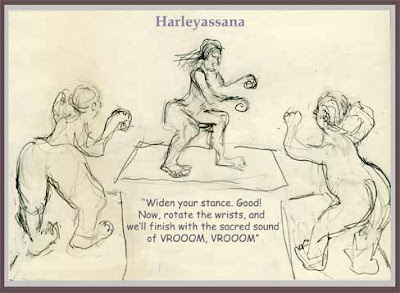 My amazing yoga teacher, Missy Hatch, has been giving satsang on her experiences learning to ride a motorcycle. It's brought up many yogic topics for her, from balance and awareness, to finding your edge, to acceptance and courage. Missy always invites wisdom from the class as well--a great teacher is genuinely open to learning. Today, class members commented on how the inner fire of creativity can stoke up to withstand the ice-water of fear, and the Course in Miracles lesson, "Your only safety is defenselessness"--how defense tightens us down, inhibiting the flow and flex of rounding corners and getting up to speed. Then we all rolled over on our backs clutching our knees to our chests, and started unkinking again. "Find the place where you can safely open into the space that's being created," Missy said, as we endured a difficult stretch, "That's yoga."